Perfect percolators! The Rapid Brew Stovetop Percolator makes 2-3 cups of fresh-perked coffee fast, easy and full of flavor. The perking process allows exact brew strength control, so it's a treat for coffee lovers everywhere. The percolator body, cover and spreader plates are constructed of sparkling, high-luster heavy gauge 18/8 stainless steel. It features a clear glass cover knob for easy observing of brew strength and a laminated Permawood handle with natural woodgrain beauty and brass-rivet quality. 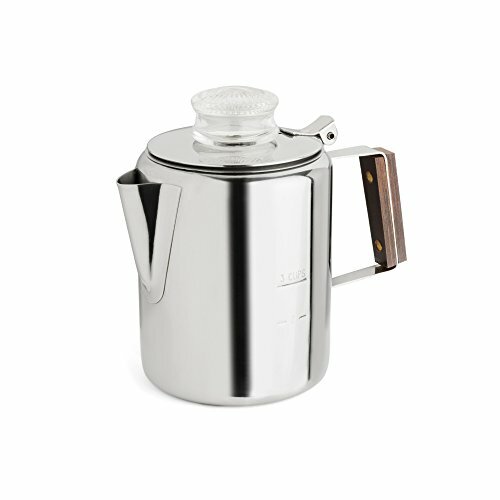 Also includes an aluminum pump and basket, and for exact measurements, the percolator features permanent cup markings. This coffee maker is non-electric, so it's perfect for camping. Great looking and great tasting! The best way to start your morning.